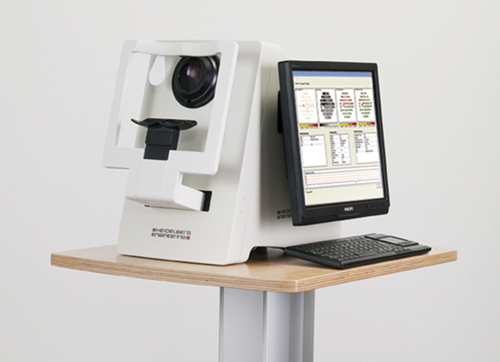 The Heidelberg Edge Perimeter (HEP) is an instrument for examining your visual field. Two different procedures can be used. One test is for early detection of glaucoma, and the other is for monitoring the progression of the disease. You will first be seated comfortably in front of the instrument and be handed a response button. During the entire examination, you will rest your chin on the instrument’s chin rest. You will lean your forehead against the head rest so that you can keep your head still. During the visual field test, you will look at a monitor in the instrument and stare at a black dot in the middle of the screen. You can blink normally. If you need a break, the examiner can interrupt the test at any time and continue it a short time later. Your two eyes will be tested one at a time. The Heidelberg Edge Perimeter provides a flicker stimulus for early glaucoma detection. This stimulus is presented at irregular intervals, and you verify if you have perceived it. The instrument thus examines the so-called sensitivity of your retina, on which you can barely see the stimulus. When the examination begins, the instrument’s screen starts to flicker. A circle is illuminated for a short time at irregular intervals. The circles sometimes appear lighter, sometimes darker. Whenever you see a flickering circle, you press and release the response button. There are also phases when no stimulus is presented. Do not worry about it; that is completely normal. The examination with the white light stimulus is used for advanced cases of glaucoma and for monitoring of change in glaucoma over time. When the examination begins, a white point of light will appear on a gray background on the instrument’s monitor. The circles sometimes appear lighter, sometimes darker. Whenever you see a point of light, you press and release the response button. Both methods determine your individual visual field. Deficiencies in the visual field can be recognised on a printout of the results. When visual field tests are repeated over several years, progression of deterioration can be documented and advancing glaucoma can be diagnosed, or the success of treatment can be measured. This examination is painless and your vision will not be impaired. Afterwards, you can drive as usual, unless your eyecare professional has dilated your pupils to conduct a different examination.